Smooth it out. Our Smooth & Serene Shampoo, infused with argan oil and ethically sourced French lavender, delivers a nourishing cleanse that gently removes dirt while lightly moisturizing and infusing your hair with a decadent scent of French lavender. Stay calm all day long. Our Smooth & Serene Conditioner seals moisture into your hair to keep frizz at bay and give you enviably smooth, glossy hair. Plus, with fast-rinse technology in each of our conditioners, you get light weight conditioning and also feel good knowing that you can help save some water since the conditioner breaks down faster. We trust you to go easy on the tap too! Our shampoo and conditioner, infused with argan oil that we deeply adore, give hair a boost of moisture and a dose of indulgent nourishment to smooth hair. We source our golden argan oil from sources who obtain this oil through a women’s co-operative with the Berber women of the area. Our formulas are also infused with French lavender. It is grown using the traditional ‘préfané’ technique, which means the lavender is cut by hand and left to dry in the fields for two to three days. This gives our product the unique fragrance of soft, floral notes balanced with slightly fruity overtures that are rounded out by a sweet balsamic. I had received product from Love beauty & planet with Argan oil & Lavender aroma specially formulated for frizzy hair. These shampoo & conditioner restore the locks smoothness, helping tame frizz while giving hair a sleeker, relaxing french lavender smell like a spa & no more bad hair. Then, what is the most interesting about this product are the mission of beauty & planet was in line. 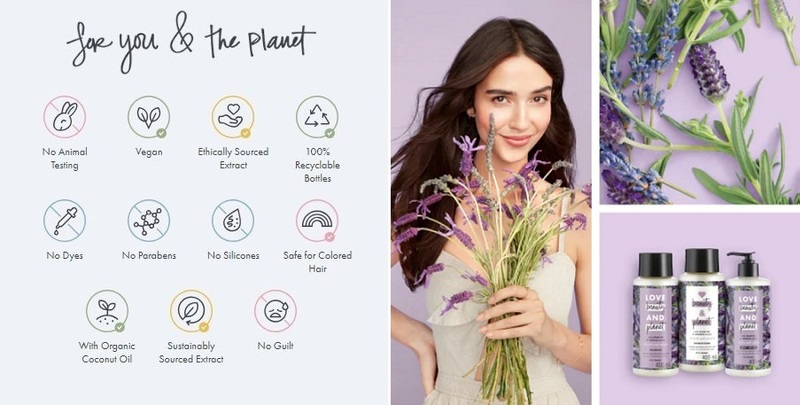 The ingredients from natural especially the lavender pick in ethically way. Chemicals free including paraben, silicone and so on because plant based ingredients only. The bottle is made from 100% recycled materials, this is the reason why it is not too clear. Definitely will buy later! Recommended for everyone! For sensitive skin also using this make your life awesome! I love organic oil, it's good friend of dry skin. I love lavender, the smell makes me clam and peaceful. Good products for those we love lavender smell. It use naturally derived ingredients. No silicones. No parabens. No dyes. Not tested on animals. Argan oil dan lavender syampu dan pelembap ini membuatkan rambut saya lebih licin dan lembut. Harumannya yang kuat berbau lavender menjadikan rambut saya tetap berbau wangi meskipun setelah memakai tudung. Meskipun hanya sedikit digunakan, ia menghasilkan buih yang banyak dan cukup menyegarkan. Bungkusannya juga menarik dan comel. Bersifat vegan dan mesra alam sudah tentu baik untuk saya dan anak-anak. Anak juga suka menggunakannya. Cuma jenis penutup agak kurang mesra pengguna dan memerlukan lebih tekanan untuk dikeluarkan. Namun saya pasti akan membeli lagi produk ini kerana ia benar-benar telah menambat hati saya dengan bauan dan kelembutannya! Usually shampoo/conditioner that leaves hair smooth tend to be abit greasy and heavy. But I like how this product can deliver soft and smooth outcome but still feels very lightweight hence my hair has some volume to it. And it smells wonderful with a faint lavender fragrance even after wash!